Natural history: Umbraculum sp. #1 is a rare nocturnal species. 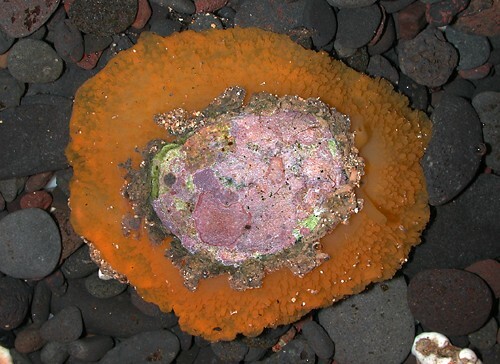 The five live animals recorded were all found in tide pools at moderately exposed sites. It probably feeds on sponges and lays a large, frilly egg mass similar to that of other Umbraculum spp. Taxonomic notes: This species is lumped with Umbraculum sp. #2 and Umbraculum sp. #3 as Umbraculum sinicum (Gmelin, 1791) in Kay, 1979 and as Umbraculum umbraculum in Hoover, 1998 & 2006. It's referred to as the "umbrella shell" by Kay and the "umbrella slug" by Hoover in that context. However, it seems likely that it's a distinct species based on its smaller, simpler tubercles; less heavily calcified shell and uniform yellow color. All three characters appear to be consistently associated with each other in photos from throughout the Indo-Pacific. Based on shell calcification and tubercle form, it's probably more closely related to the Umbraculum population found in the Eastern Pacific (also likely distinct) than to the other Indo-Pacific and Atlantic forms. (Note 3) Pilsbry, 1917 states that "Umbraculum sinicum aurantiacum (Pse.) which Mr. Thaanum has taken at Hilo, appears to be sufficiently distinct from U. sinicum by characters of the shell to warrant a subspecific name." The name suggests that it might refer to this species but Umbraculum sp. #3 is also a possibility. The shells labelled U. sinicum in Morris, 1974 and Tinker, 1958 may be this species but their assignment is ambiguous. Photo: CP: 65 mm: tide pool; Napili Bay, Maui; Dec. 12, 2004. Note 1: The shell illustrated here (see photo) showed moderately strong red fluorescence under ultraviolet light (395 nM), mostly on its interior surface. Some juvenile shells identifiable only to "Umbraculum sp." also show a hint of red fluorescence. Note 2: There is little variation in color or tubercles throughout its range from Hawaii to Reunion. Note 3: The Eastern Pacific population has a uniform background color in any particular animal and a lightly calcified shell. However, its background color is variable and its tubercles are tentacular (particularly in young animals). The Atlantic population has very large, cauliflower-like tubercles and a moderately calcified shell.